That is how Australia deals with 1.3 million joeys every year after their mothers are shot for their meat or skin. They are the by-products of the greatest massacre of wild animals in the world. The largest massacre of wild land animals the world has ever known is taking place in Australia right now! Imagine this. A mother kangaroo with her beautiful joey at night in the vast outback. It is a scene millions of years old. What is new is the roar of a four-wheel drive. She turns towards the noise and is transfixed by a searchlight. A rifle cracks and a bullet tears a hole in her neck. 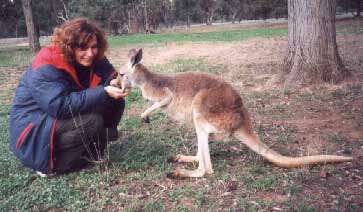 She falls, in pain and unable to save her joey, who retreats into her pouch for safety. 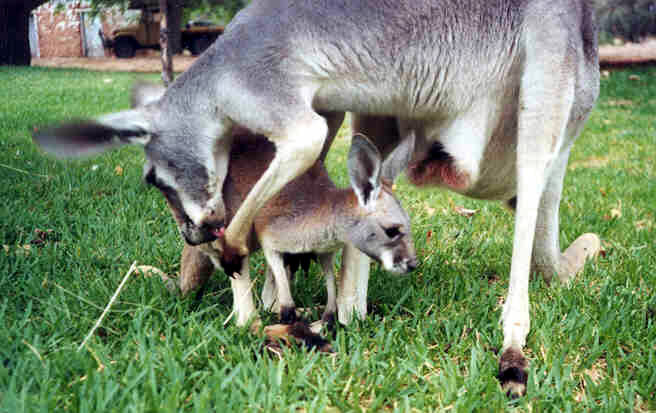 The first thing the hunter does is to search the pouch and, feeling a joey inside, pulls him out. The hunter tosses him to the ground and stamps on his head. The joey writhes in agony. The mother struggles as her leg is slit open and a hook inserted through it. She is hauled up onto the truck and slowly dies. The scene is repeated all night long. Older joeys frantically hop away when their mothers are shot - to die a slow and lonely death from cold or starvation. This is the reality of kangaroo killing. But the killing continues. Every restaurant, café and store that sells kangaroo meat or leather supports this massacre. And they are all fed a string of excuses by the Australian Government. Not one of them stands up to scrutiny. A four-year study by CSIRO (Commonwealth Scientific & Industrial Research Organization) found that kangaroos never visit 95 per cent of wheat crops. However, farmers and the Australian government still refer to kangaroos as pests. 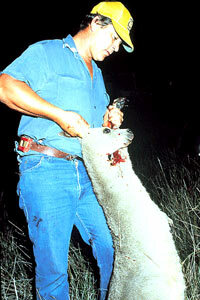 In fact, commercial killing takes place in the outback where crops are never grown. 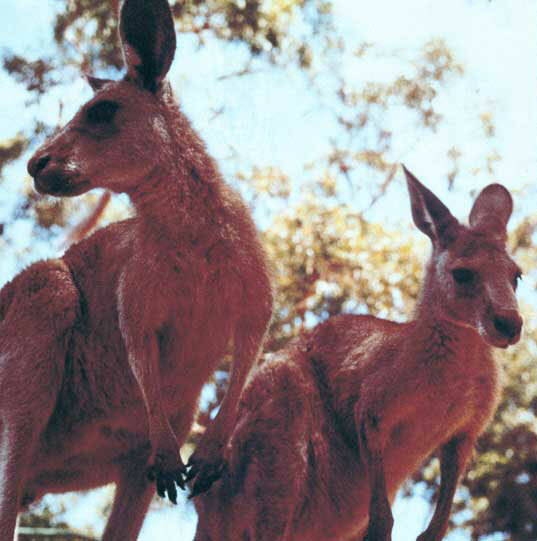 A six-year study by Dr. Steven McLeod (University of New South Wales) - the biggest ever undertaken - examined whether red kangaroos affected sheep farming. It found no competition for food between sheep and red kangaroos - even in drought conditions. Kangaroos have evolved with the Australian environment, and are part of it. Destruction comes from 160 million hard-hoofed sheep and cattle. Australia has the worst wildlife record in the world - six species of kangaroos extinct, four more extinct on the Australian mainland, 17 species endangered or vulnerable. No one monitors, let alone controls, the killing. 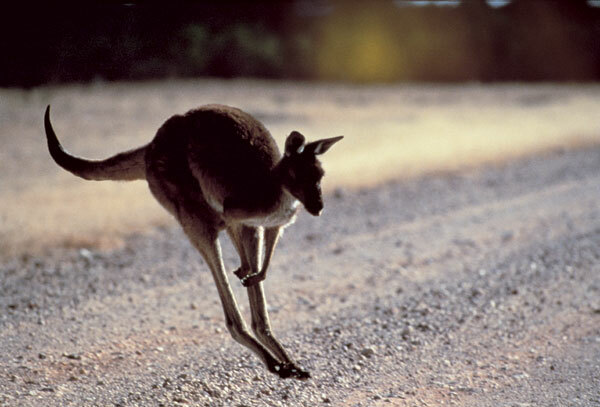 Kangaroos are shot at night in the vast outback. 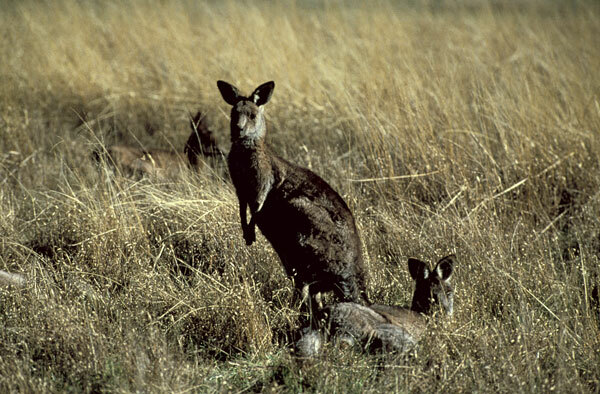 Joeys at foot, still reliant on their mothers, are not even mentioned in the Code of Practice. Kangaroos have never been a plague. They have been wiped out in many regions. In others, their numbers build up in order to withstand the regular droughts that wipe out half the population. Kill quotas for 2003 are 6.5 million - but this figure ignores joeys, road deaths, illegal and non-commercial kills. This annual death toll amounts to 10 million - a patently unsustainable figure. 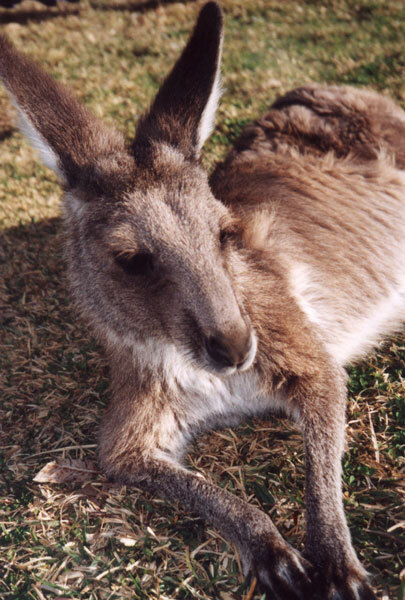 Fact - Kangaroos are killed to earn foreign currency, which is why the meat and leather is promoted around the world. Having built an industry with political clout, self interest will ensure it carries on killing, whatever its impact on kangaroos. The British organization VIVA has virtually ended the sale of kangaroo meat in Great Britain. They persuaded over 1,500 supermarkets to withdraw it. They are now tackling the much more lucrative trade in kangaroo skin, which is used to make football boots, handbags and baseball mitts. In the UK and the USA, VIVA is protesting outside shops that sell football boots and urging shoppers to boycott all manufacturers that use kangaroo skin. Animal Friends Croatia are bringing this international protest to shops in Zagreb, Croatia. It is vital for the survival of the kangaroo to stop the trade in their skins. Manufacturers prefer to use the largest skins to make athletic footwear. These skins come from the big red males who take 10 years to reach alpha status and are being continually massacred. Few survive to pass on their superior genes to the next generation. The remaining smaller and weaker males are producing offspring less likely to survive a major drought or other natural disaster. We must stop this before Australia's kangaroos are wiped out! It is frightening that leather suppliers are complaining that there are too few large red males left. Skins are smaller and smaller since they now shoot juvenile kangaroos. International pressure is vital to stop the senseless butchery of these beautiful wild animals. We are taking the campaign to the street; targeting companies using kangaroo skin. That is what VIVA did with supermarkets and stores stocking kangaroo meat, until they completely wiped out this cruel and senseless trade. Our first target is Adidas and their "Predator" boot, worn and promoted by well-known football players. Adidas is far and away the leader in "premier football boots," holding 70 per cent of the market worldwide. Adidas is a driving force behind an industry that bludgeons millions of young joeys to death every year. We are urging shoppers not to buy any Adidas products until they stop taking part in the largest wildlife massacre in the world. Please join the fight to save these magnificent animals. Demand an end to the biggest massacre of wild animals in the world. Write letters to: the Prime Minister of Australia, the Minister for Agriculture, the Minister for the Environment; the Australian Ambassador in Zagreb and the Australian High Commissioner in London; and ask them to outlaw this brutal massacre. Write also to Adidas and ask them to stop using kangaroo leather for their boots and trainers, and to use synthetic materials instead. (Animal Friends can give you the addresses and sample letters). 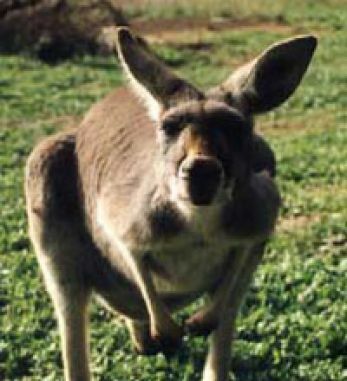 If you encounter it, refuse to eat kangaroo meat and complain to any restaurant that has it on the menu. Report it to Animal Friends. Do not buy kangaroo leather! Choose football boots, baseball gloves and handbags that are made from modern synthetic materials instead. Write "letters to the editor" to daily and weekly newspapers, and to radio and TV stations. Contact relevant talk shows and raise this question. Support Animal Friends Croatia and VIVA. Join us! A search at the Croatian Chamber of Commerce did not find a single importer of kangaroo meat or leather from Australia. 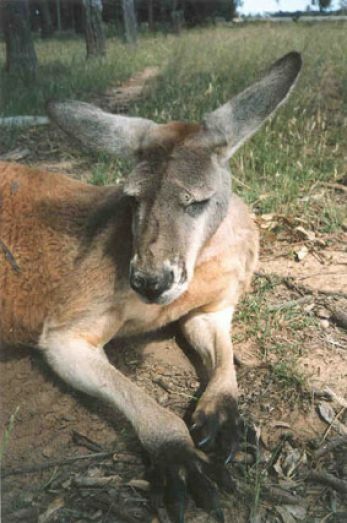 One restaurant known to have offered kangaroo meat does not do so any more. So far, Adidas "Predator" football boots have been seen in a shop in Zagreb. This is the largest massacre of wild land animals ever to take place in the world, similar to the massacre of the bison in the USA at the end of the 19th century. However, what about the situation in Croatia? 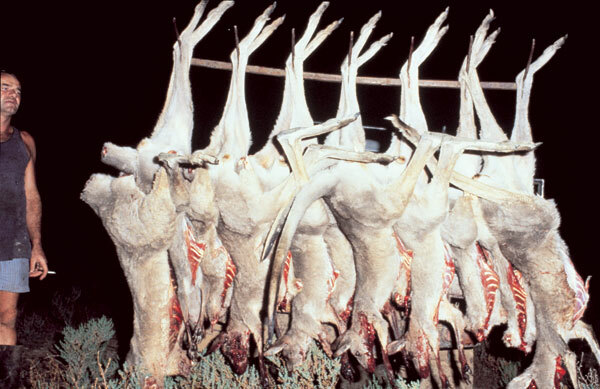 Say NO to venison; shoes and bags made from exotic skins; and to the farming and slaughter of ostriches, chinchillas, tuna and other animals.